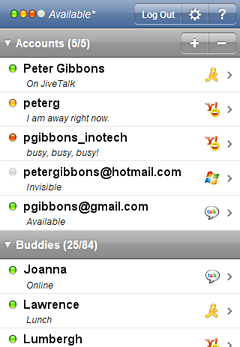 JiveTalk mobile messenger brings the desktop Instant Messaging experience to your mobile phone. With JiveTalk, you get a complete IM solution with 24/7 real-time connectivity to all of your IM buddies. Stay connected on all your IM accounts, all at the same time, all on your phone! 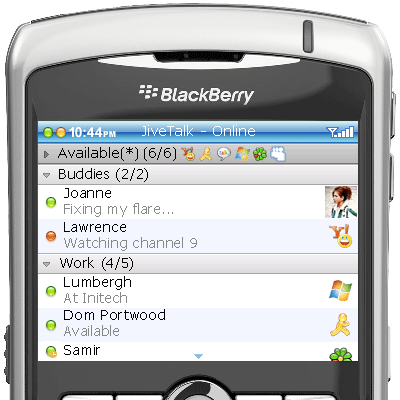 JiveTalk is currently available for Blackberry, ipod Touch, IPhone and Windows Mobile. JiveTalk for Blackberry cost a fee which starts at $19.95 while JiveTalk for iPhone is free at no cost while JiveTalk for Windows Mobile is still in beta development. Coincidentally, I find the user interface *a bit* similar to Digsby, which basically does the same thing but on desktop only. The JiveTalk application has recently been renamed to BeeJiveIM.